The acceptances for next month's ITF Grade B1 Pan American Closed in Tulsa have been posted, and for what I believe is the first time ever, the No. 1 junior in the world is among them. Defending champion Kayla Day heads the girls list, and although she may, of course, withdraw in the next week or two, the depth found in the current US junior girls will assure a good field. The US girls receiving direct entry, just in the ITF Top 100 alone are: Day, Taylor Johnson, Maria Mateas, Caty McNally, Morgan Coppoc, Natasha Subhash, Ashley Lahey, Ellie Douglas, Carson Branstine, Hurricane Tyra Black, Kylie McKenzie, Victoria Emma and Abigail Desiatnikov. The 28 others include US Open Junior quarterfinalist Vanessa Ong, Grade 1 International Hard Courts semifinalist Hailey Baptiste and 18s Clay Court champion Ann Li. Of the 46 girls accepted, 41 are from the United States. The top-ranked boy in the acceptances is Italy's Liam Caruana, whose immigration status has been approved by the USTA, allowing him to compete, as he did in the Easter Bowl, in this geographically closed event. Top 100 US boys accepted are Sam Riffice, Oliver Crawford, Gianni Ross, Trent Bryde and Patrick Kypson. It's difficult to overstate how important this tournament is for those Americans (and Canadians and Central/South Americans) eligible to play the junior slams next year. Aside from the US Open and the Orange Bowl, no US tournament provides more points, so a deep run there can provide a major boost in amassing enough points for the 2017 junior slams. Former UCLA Bruin Jennifer Brady, still in her first full year on the WTA tour, had not won a WTA-level match (she has won matches in the WTA 125 series) until this week in China, where she has now won two at the Guangzhou International level tournament. Brady defeated qualifier Anastasia Pivovarova of Russia in the first round and No. 6 seed Danka Kovinic of Montenegro today 6-3, 7-5 to reach the quarterfinals, where the 21-year-old will play 18-year-old Croatian Ana Konjuh, the No. 3 seed. Alison Riske, the No. 4 seed, has also reached the quarterfinals, where she will play unseeded Lesia Tsurenko of Ukraine. 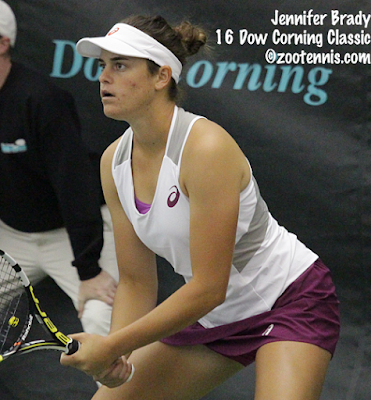 At the $75,000 USTA Women's Pro Circuit event in Albuquerque, 18-year-old Caroline Dolehide qualified, beating top seed Valeria Solovyeva of Russia 6-4, 6-3 in Tuesday's final round, and today she won her first round main draw match, beating 19-year-old Nadia Podoroska of Argentina 6-3, 7-6(4). Dolehide, who plays No. 3 seed Veronica Cepede Royg of Paraguay next, joins Sachia Vickery and No. 5 seed Taylor Townsend as the only Americans to reach the second round. At the $50,000 ATP Challenger in Columbus, Ohio State junior and NCAA finalist Mikael Torpegaard is into the quarterfinals of his first ever Challenger. The 22-year-old wild card from Denmark defeated Nick Meister in the first round and No. 4 seed Peter Polansky of Canada 6-4, 6-7(2), 6-4 in a second round match this afternoon. Torpegaard served for the match at 5-3, was broken, but hit two backhand winners, the second on match point, to break Polansky for the victory. The ATP website has comments from Torpegaard about his wins and the allure of college tennis for players from small countries. The other quarterfinalists in Columbus are all former collegians: Tennys Sandgren, Sekou Bangoura and qualifier Roberto Quiroz of Ecuador. At the $10,000 men's Futures in Irvine, California, UCLA has four former or current players into the second round: top seed Mackenzie McDonald, the 2016 NCAA champion, who took a wild card into the event, senior wild card Joe Di Giulio, junior wild card Martin Redlicki and 2014 NCAA champion Marcos Giron, the No. 8 seed. Giron is returning to competition after two hip surgeries last winter. McDonald and Di Giulio play each other in Thursday's second round. The $25,000 Futures in Niagara, Canada this week, which honors the memory of former University of Kentucky All-American Bruno Agostinelli, has plenty of Americans through to the second round, including top seed Adam El Mihdawy and last week's Canadian Futures finalist Rhyne Williams. Two current Cornell players--qualifier Lev Kazarov of Russia, a freshman, and wild card David Volfson of Canada, a sophomore--have also advanced to the second round.